Perhaps the biggest allure of credit cards is the ability to spend without having to carry cash. But for some people, part of the appeal is the belief that frequent card use can bring a host of incredible rewards. In rewards schemes, the cardholder earns a fraction of the amount spent in the form of cash, vouchers and gifts. Free tickets to a dream destination, weekend stays at a luxury resort, dining and retail discounts are just a few of the freebies up for grabs. Because the offers often look too tempting to resist, cardholders are increasingly pursuing air miles and points to supplement their expenses. Consequently, as consumers swipe more, spending and debt levels also rise. A Federal Reserve Bank of Chicago paper published in December 2010 tackled the impact of credit card rewards on spending and debt in the United States. Authors Sumit Agarwal, Sujit Chakravorti and Anna Lunn examined whether consumers spend more when given rewards and if they incur more debt because they receive incentives. Specifically, they reviewed thousands of accounts of individuals enrolled in a one per cent cash-back programme. "We find that consumers generally spend more and increase their debt when offered [rewards]. The impact of a relatively small reward generates large spending and debt accumulation," Agarwal, Chakravorti and Lunn wrote. On average, a consumer spent about $68 (Dh249.71) more and owed $115 more per month during the first quarter of the cash-back programme. "Our results confirm that cardholders not only increase their spending but also their debt," they said. "The greater increase in debt compared to spending suggests that average monthly payment drops more than the marginal increase in spending from the cash-back programme." Spending increases were more significant among married cardholders compared to single consumers. Those with higher credit thresholds also showed a tendency to swipe their card more and pile up more debt. "We find that cardholders who do not use their card prior to the cash-back programme increase their spending and debt more than cardholders with debt prior to the cash-back programme," they added. Besides encouraging excessive spending, many financial experts argue that reward schemes are not really worth it because the value of the incentives rarely offsets the amount spent by the cardholder. Many banks in the UAE and abroad promise to offer rewards equivalent to 1 per cent of the purchase, which means a cardholder has to spend Dh10,000 to get Dh100 worth of cash or freebies back. One bank's latest offer is an iPad, to be given away to a customer who has accumulated more than 400,000 air miles or spent more than Dh400,000 on his credit card. But it doesn't mean reward cards are bad for everyone and need to be avoided at all costs. "It depends on the individual scheme," says Richard Taylor, a chartered financial planner at Acuma Wealth Management in Dubai. Taylor admits he is one of those cardholders who find loyalty programmes useful. "I personally use my credit card to collect air miles and I find the rewards worth the cost and hassle of having a credit card. But that is because I pay off my balance each month and don't really incur any costs nor experience any hassle. Used this way, the right rewards scheme is a great opportunity to get something for nothing." This may not be the case for debt-laden consumers who don't use their plastic money responsibly. "The problem is, this is clearly not the way many people manage their credit card and that is exactly what the providers are hoping for," he points out. "They want to encourage you to get into debt and stay in debt as this is how they make money from you. So it is up to the end user to take responsibility for using their credit card correctly, as it would be unfair on those who do play the game [ie build up rewards by using their cards without getting into debt] to lose the perks because some people cannot manage their finances." Steve Gregory, managing partner at Holborn Assets, agrees that if used wisely, credit cards that are tied to a rewards programme can work to a consumer's advantage. "Used unwisely, they create more profit for banks than any of their other retail banking activities." However, Gregory observes that defaults in recent years have affected the profitability of UAE banks. Residents in the UAE are estimated to have owned about 70 per cent of the credit cards in the GCC. Datamonitor International's July 2010 data showed that more than a fifth of UAE expats had been unable to meet loan or credit card payments in the previous twelve months. To avoid the risk of racking up huge credit, consumers who sign up for incentive programmes are advised to use their card only for regular purchases instead of seriously pursuing air miles or reward points. This way, they won't spend more than what they earn, but still earn freebies at the same time. Regular spending can be anything from groceries to utility bills that one pays on a routine basis, with or without an incentive. "All it takes is some personal organisation and discipline, which is available to all of us," says Taylor. However, financial experts warn it is so easy to rack up debt, so if you honestly feel you can't afford to settle all your dues on time, you are better off not having any credit card. "Credit cards offer a superb and almost cash-free way of managing finances, but it is part of the make up of many human beings not to want to wait for things they desire, and to spend all they can access as soon as they get access," Gregory said. "It is so, so easy to build up credit card debt, especially in a place such as Dubai," adds Taylor. "Only using your credit card to pay for routine spending may go some way to helping. However, I am of the opinion that if you are the sort of person who struggles with this, you are likely to just use your debit card if you know there are surplus funds in your account that should be earmarked for your credit card bill." Taylor's advice is simple: "If you are the sort of person who can have a credit card and pay it off in full each month, then have one and exploit the advantages. If you are not this person, then stay well away, as no amount of air miles or free/reduced golf will compensate for the financial and emotional turmoil of unpaid credit card debt." This card is good for those who love to buy groceries as it promises to give away shopping vouchers. For every Dh10 spent at any Geant Hypermarket and Le March Supermarket in the GCC, a customer earns two "La Carte" points. It doesn't mean only your purchases at the named shops will be credited. You can also earn one point for every Dh10 spent in the UAE or anywhere else worldwide. You only need to spend at least Dh10 to be eligible for points. However, a minimum of 100 points is required to get a reward, which means a customer has to spend at least Dh500 on his card to start redeeming grocery money. If you manage to increase your points to 1,000, you can claim Geant vouchers worth Dh100. In real terms, your Dh5,000 will give you Dh100 back, or about 2 per cent of your purchase. Compared to other schemes in the UAE, that's one of the highest reward values. This card also does not have an annual fee and any points earned will not expire. There are other benefits to enjoy, such as up to 20 per cent discount at various dining outlets across the UAE, up to 55 days interest-free credit and a chance to win Dh1 million every six months. For every dirham spent on the credit card, whether for air tickets, movie tickets, groceries, hotel rooms or dining, you will get one "Noor point". Points earned can be redeemed for cash or Flydubai e-vouchers and are valid for up to three years. A cardholder needs to accumulate 10,000 points to request for redemption, or spend Dh10,000 dirhams to get cash or voucher worth Dh100. So, if you intend to fly to Karachi and you manage to raise 10,000 points, you're likely to shell out extra cash to get the ticket. Depending on the card type, you may have to pay an annual fee between Dh150 (for Classic Shams card) and Dh1,000 (for Infinity Shams card). NIB Light cardholders don't pay annual fees. Holders of Fit For Life cards are entitled to 15 per cent off on full meal packages and 8 per cent off on "Serenity" lunch packages at Health Factory, free access to a golf club at Arabian Ranches in Dubai (for Infinity holders), as well as free gym access at Intercontinental Hotel in Abu Dhabi and Emirates Towers Health Club (for Platinum and Infinity holders). For every Dh1 spent in any retail transaction, the cardholder earns between 0.5 to 1.5 "NBAD Stars", which are redeemable within three years from the last day of the month during which the points are earned. To claim a reward, a minimum of 5,000 stars is required, which is equivalent to Dh5,000 worth of expenditure for Classic cardholders. Depending on the points earned, you will be able to use them to pay for airline tickets, hotel stays, restaurants, electronic items, jewellery, entertainment, furniture or household items. Cash redemption, however, is not available. To claim a ticket worth Dh800, a Classic cardholder needs to accumulate 80,000 points, while 15,000 points will be enough to pay for a meal worth Dh150. So, you get back about 1 per cent of your money spent. Additionally, the rewards scheme does not only offer a high redemption value for each point (one NBAD Star equals one fil), it also allows a customer to earn up to 10 bonus points for every Dh1 spent at any of the bank's rewards partners. This is mainly an air miles rewards programme which promises to offer free tickets to cardholders. You can get back as much as 2 per cent of what you spend, depending on the card type and average monthly expenditure. Purchases on the Platinum card worth Dh25,000 could earn a customer up to 500 "AA dirhams", redeemable for a ticket worth Dh500 on Air Arabia. That's 2 per cent of your money spent. If you make Dh5,000 worth of purchases on average per month, you will earn back 50 "AA dirhams" monthly, so in a year, you can get a free ticket worth Dh600 from Air Arabia. That's a Dh600 yield out of a Dh60,000 spend. There is no minimum threshold required for redemption, but the points earned are valid for 24 months. An annual fee worth Dh100 is also collected from Classic members and Dh200 from Platinum holders. For Platinum cardholders, the best reward this programme offers is a free airline ticket upon first payment, as well as a Priority Pass that provides lounge access at over 600 airport lounges across 300 cities around the world. Other perks include a 10 per cent discount at Sharjah Duty Free and a 5 per cent discount on Air Arabia Holidays. For every dirham spent, cardholders can earn 2.5 reward points, which can be used to get free flights, shopping vouchers and for annual membership fee waiver. When dining anywhere in the UAE, customers get 10 per cent cash back. Consumers can earn as much points as they can, but cash back on dining is capped up to Dh3,600 annually. Points earned are valid for three years and a cardholder is required to earn at least 10,000 points to be able to request for redemption. The incentive value for 10,000 points is equivalent to Dh50, while 100,000 points can be redeemed for Dh1,000 worth of reward. That means the more you spend, the bigger the bonus and you get back 1.25 to 2.5 per cent of your card spend. The good thing is if you're aiming for free tickets, the points earned can be claimed for any airline ticket online or through travel agents. Cardholders also enjoy complementary airport lounge access at 600 lounges globally. For those who fancy golf, Barclaycard Edge offers complementary golf and buy-one-get-one-free offers in UAE, as well as 30 per cent discount at more than 300 courses worldwide. This rewards scheme is ideal for both travellers and avid shoppers as it is packed with numerous freebies from gift vouchers, frequent flyer miles from leading airlines, to cash back and waiver of annual membership fees. Cardholders are automatically enrolled into the programme, so anyone can collect "Plus" points that have no expiry. All retail purchases offer 1 to 2.5 per cent cash back. Maximum monthly earning for points, however, is capped up to 3,000. Members also have to pay annual fees, which range from Dh99 to Dh1,500. 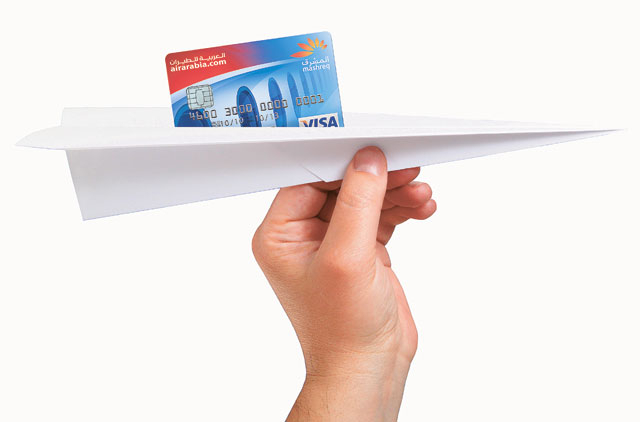 Cardholders get 1 to 1.5 air miles for every dirham or two spent, depending on the type of credit card. Customers can earn rewards points twice when they shop at Air Miles partners. The more you swipe your card, the bigger your chances of earning freebies like airline tickets, hotel stays, restaurant meals, gold, jewellery, electronic items, fashion, gifts and stationery, among others. You can accumulate as much points as you like and there is no expiry to worry about, but to redeem rewards, you need to meet the minimum threshold of 12,000 air miles, which is roughly equivalent to Dh12,000 spend. A minimum spend of Dh8,600 is also required to qualify for rewards, in case of Premier customers. But this can be further reduced if cardholders shop at Air Miles partners. One of the latest rewards is an Apple iPad 2 (3G, 32GB), redeemable for 476,000 miles. That means you need to log more than Dh300,000 worth of purchases on your Premier card to bring home the prize. If the iPad costs Dh2,899, you get about 1 per cent of your money spent. Premier and Advance customers are exempt from annual membership fees, while other cardholders pay anywhere between Dh150 and Dh600. The rewards scheme is also traveller-friendly, as it offers free flights on any airline in First, Business or Economy class. There are no blackout dates and members can redeem one-way or return fares.